Contemporary collection from Altran double bracket in steel finish only. Orion finial for 1 1/2 inch diameter indoor curtain rod. Available in two colors in stock (black and dark brown), ready to ship, custom colors 5-7 days. It can be used indoor only. Charleston collection by Design Elements. Indoor Use Only : Length: 4 1/4" : Width: 3" : Material: Acrylic w/ Steel Collar : Finish Shown: Black & Acrylic : Priced and Sold (as/by): Each : Availability: Black and dark brown ships in 1-3 business days, custom colors 5-7 days. Contemporary collection from Altran Tors finial in steel finish. Clip rings for the Valencia 1" curtain rod. Easy clip-on for your standard curtains. Some colors are more than base price. Stock Colors: Black, Antique Gold, Rust. Tension drapery rods by Graber. For screwless mounting, use this curtain spring rod by Graber. 1 per envelope. Polyester traverse rod cord, white finish. Use to replace existing worn cords in your traverse rods, or new assembly. Fits all traverse rods. White finish. by Graber Minimum 100 yards. Use for drapery bottom weights. Helps drapery fabric lay better, concealed in bottom hem of the curtain. 100 yards per box. Bay windows and corner window angle sections for the Kirsch 9046 Architrac system. Use splice 9646-061 to connect sides to straight sections and be sure support are used in the bend section for support This is a ceiling mount or recessed ceiling mount product. Instructions for hanging curtain rods are included. White finish, includes two end brackets and two support brackets. Projection, 2 3/4 to 4 1/4 inches. Clearance 2 to 3 1/2 inches. Extra long drapery rods. Light weight fabrics like sheer curtains work well with this rod. Window drapery rods by Graber. Graber super heavy duty features include a universal front loading end bracket, metal adjustable and reversible master carriers ball bearing end pulleys, a spring loaded side gate for adding or removing slides, molded, canted slides, can be converted to one way draw, scored center support base for easy mounting on narrow casings, universal cam lock stirrup, braided polyester cord, and angled tip on overlap arm. Instructions for hanging curtain rods is included. Two end brackets and five support brackets are included. White finished curtain rod by Graber with scored center support base for easy mounting on narrow casings and a universal cam lock stirrup for easy installation. Comes with 76 slides for attaching draperies with drapery pins, two end brackets and five support brackets. Braided polyester cord, and angled tip on overlap arm for durability. Recommended weight limit is 1 1/2 pounds per foot. Note: this item can be shipped FedEx 3 Day Select. You must choose FedEx 3 Day Select from shipping method menu at checkout. A commitment to quality. White finish. Projection, 2 3/4 to 4 1/4 inches. Clearance 2 to 3 1/2 inches. Graber super heavy duty features include a universal front loading end bracket, metal adjustable and reversible master carriers ball bearing end pulleys, a spring loaded side gate for adding or removing slides, molded, canted slides, can be converted to one way draw, scored center support base for easy mounting on narrow casings, universal cam lock stirrup, braided polyester cord, and angled tip on overlap arm. Full pack price on 6 each. 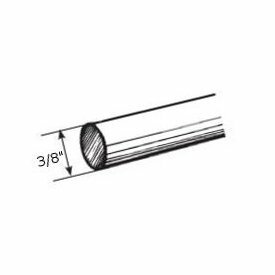 Steel curtain rod profile by Kirsh are available as components for DIY projects or assembled to you specifiactions. Curved and bend configurations are available for bow and bay windowstyles. Many styles can be opened by hand or by cord. Architrac systems are used in homes, hospitals, hotels and other commercial building where demanding performance is desired. Sizes range from 12 feet to 20 feet and can be joined to achieve even wider widths. All styles except the 94008 are made of sturdy aluminum that can support up to 80 pounds. Many styles can be cut to size for shipping and convenience. Custom assembled tracks are available in standard two way or one way draw."